At lunch time one day last week, while away from home, I was standing in line for a tofu reuben when I introduced myself to an older woman behind me. After chatting for a couple of minutes, she shared that she lives about two hours away from me and is often in Boston, and she suggested that we might meet up when she comes to town. Under most circumstances this interaction might strike me as a bit strange. But this was not normal circumstances — I was at the National Havurah Committee Summer Institute where random introductions and quick friendships are the norm. I won’t claim to have left the Havurah Institute with dozens of new best friends, but I was able to get a chance to get to know a lot of really cool people in a variety of contexts: through classes, workshops, davenning, and of course through casual introductions while waiting for lunch. The National Havurah Committee Summer Institute is a community which is built through hundreds of friendships, conversations, and encounters. It is a place in which communal memory is present but which also embraces newness — my tofu reuben encounter is a microcosm for the openness with which participants greet not only new people, but new ideas and issues. On the third night of Institute all participants were invited to a yearly “community conversation” in which everyone was given the chance to speak and to listen to one another’s feelings and ideas about a sensitive topic in a judgment-free atmosphere. In the conversation which I facilitated people shared extremely differing, and at times contradicting, opinions and experiences, but that did not affect the openness with which people heard what others had to say. 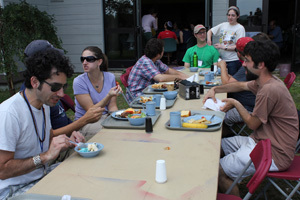 In addition to the individual relationships and the larger community conversation, an example of the inclusivity that permeates this community is that only days after leaving the institute I was asked to be on the planning committee for next year, and to act specifically with a lens toward newcomer inclusion. I love (though am not surprised) that there is a specific person on the planning committee designated to making new people feel welcome. I am also excited (though again not surprised) that as a relative newcomer myself, I was asked to assume this role. I am excited to have an official role doing something which comes so naturally to people in this community. I hope that you’ll think about joining us next year — I promise I (along with a couple hundred others) will make sure you have a great newcomer experience!